Birds have become rather well adjusted to urban settings, which is in itself an evolutionary feat. But add it to the fact that the number of airplanes has also increased, and you have a recipe for an aerial disaster. Bird-plane collisions, or “bird strikes,” are a major aviation concern. They endanger lives and cost millions of dollars in plane repairs. This is where Carla Dove, a forensic ornithologist, comes in. Dove leads the Feather Identification Lab at the Smithsonian Institution where she analyzes feathers and tissue from birds involved in strikes in order to identify them at the species level. 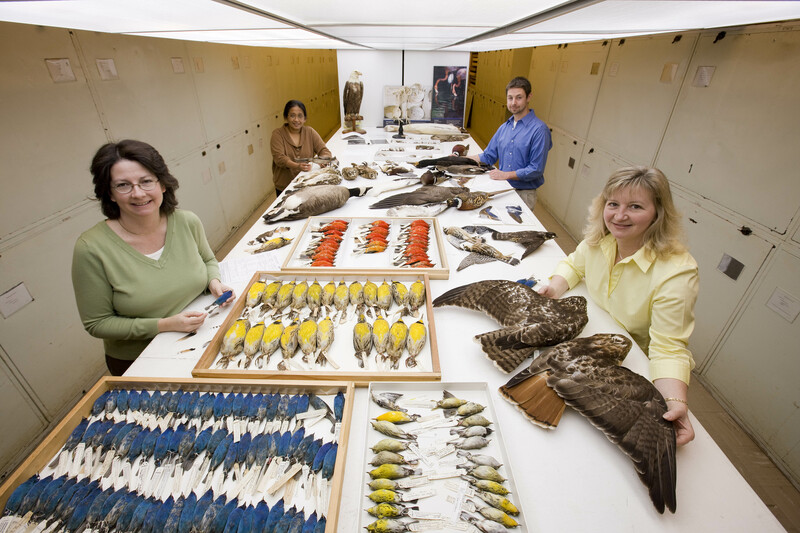 The museum collection has over 650,000 samples of different birds, which lab members can compare with the bird remains collected after collisions. Knowing the kinds of birds that run into planes then helps airport staff to figure out ways to fend off such birds. Here, she shares insights about her lifesaving work. How does your work affect the aviation industry? I think it’s basic biology in that you have to know what species are causing problems before you can do anything in an intelligent way to fix the problem. If you have pests and you want an exterminator to come in and fix the problem, he has to know what the pest is. If it’s cockroaches and he’s treating for ants, it’s not going to be very effective … The data [we collect] are even used by engineers. They will take the species of birds that are causing damage, average their weights and then design new aircraft engines based on it. All these management and design issues really would be a stab in the dark if the bird species weren’t known. What’s a typical day like for you at work? A typical day here at the Feather Identification Lab consists of first of all getting the mail. Every day we receive on average 20 bird strike reports from all over the world. But now, since it’s fall migration and birds are heading south, it’s not unusual for us to get 100 samples a day. So we open the mail and that’s when our day starts. We sort the samples according to how they can be identified. If we have small pieces of tissue, we send that to our DNA lab. If it’s whole feathers, we clean and take them to our research collection for identification by comparison with museum study scans. Once we determine the species of bird, we enter the identification into our online database, and that information is then used for a variety of purposes. If the people on the airfield know the species of bird then they will know what it likes to eat, when it migrates and where it likes to rest and hang out. And this is important because over 90 percent of the bird strikes happen when the airplane takes off and lands. It helps them determine what to do to prevent birds from being attracted to the airfield. If they know what to do on the airfield to change the environment or to scare the birds away or keep them from wanting to come in there, then they can prevent a lot of the damage right away. You know, I think it’s coming in here and just waiting to see what’s coming in the mail each day, because every case is different and every case is a new surprise. It’s like opening up Christmas presents! But overall we probably would say it feels good for us to be able to do something here in this big museum collection that actually has a connection to human safety. Using these collections that are over 150 years old to connect to modern safety issues is a very satisfying part of the job. Naveena Sadasivam recently graduated from the American University of Sharjah with a B.S. in chemical engineering and a minor in English literature. She has spent the last four years designing processes and modeling equations on simulation software, working at a natural gas refinery, freelancing for Climate Control ME, and tutoring students. Having always loved science and writing equally, she hopes that SHERP will help her unite both her passions. Follow her on Twitter @NaveenaSivam and check out her blog, The Fugacity Coefficient. Wow…Never knew such kind of scientific data was being collected. More interesting is the way it’s being used!